Carettochelys insculpta occurs in a tropical habitat of Papua New Guinea, Irian Jaya and top part of Northern Territory, Australia. The actual habitat ranges from 5 °S to 16°S and from 128°E to 145°E. The species inhabits rivers, lakes and other water bodies. Click on the images below to view two pictures of the East Alligator river (Northern Territory, Australia) and Kikori river (Papua New Guinea) which represent a natural habitat of Carettochelys insculpta. 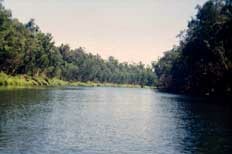 The picture of Kikori river has been provided by W.H.Bandisch. "In Papua New Guinea, Carettochelys insculpta inhabits rivers (including estuarine reaches and river deltas), grassy lagoons, swamps, lakes and water-holes of the southern lowlands (Leim and Haines, 1977; Groombridge, 1982). Locals of the Purari region claim that the hatchling turtles congregate in the lower delta and feed on vegetation and fruits of mangroves. In Australia, there are no substantiated reports of Carettochelys insculpta occurring in estuarine areas (Press, 1986; Georges and Kennett, 1989) but it is known from the clear, shallow, continuously-flowing waters of the Daly drainage (Cogger, 1970; Cann, 1972; Webb et al., 1986) and from lowland billabongs, upland billabongs and plunge pools of the Alligator Rivers region (Legler, 1980, 1982; Press, 1986; Georges and Kennett, 1989). The preferred dry season habitat in the Alligator Rivers region is typified by Barramundi Creek (Legler, 1982) and Pul Pul Billabong (Georges and Kennett, 1989). Average depth was approximately 2 m but there were holes between 3 and 7 m deep. The substratum was sand and gravel covered with a thin layer of fine silt and litter. Fallen trees and branches, undercut banks, exposed tree roots, and local accumulations of litter provided a diverse range of underwater cover for turtles. The banks of the billabongs were covered in a dense broadleafed forest, including the important turtle food Ficus racemosa. The many small sandbanks adjacent to the water were more than adequate in number and size for nesting. Water flows through the billabongs in all months of most years" (Georges and Rose, 1993). The upper region of Northern Territory has a monsoon-like climate. Virtually the entire rainfall occurs in the wet season, which varies in length but is generally confined to the November-March period; October and April tend to be transitional months - with the dry season lasting from about May to September. Annual rainfall at Darwin* (12.4245°S, 130.8832°E) averages approximately 1900 mm. Prevailing winds are easterly to southeasterly in the dry season and northerly to north-westerly in the wet season, and like other parts of northern Australia, the region is subject to cyclones. For climate details for Darwin please click on this link. The diagram number 1 is appropriate for the Carettochelys population in south-flowing rivers in Irian Jaya whereas the diagram number 2 is appropriate for the population inhabiting the rivers of Papua New Guinea. Finally, the diagram number 3 shows the temperatures and precipitation for the upper Northern Territory region. While the diagrams #1 (Irian Jaya) and #2 (Papua New Guinea) are more or less resembling the same climatic condition concerning the air temperature and precipitation, there is an evident difference between the first two diagrams and the diagram #3 (Northern Territory). The annual mean temperature in the first two regions is slightly lower than the annual mean temperature in the third region (NT). As for the precipitation, it rains more in Guinea (approximately 5900 mm per year) than in Northern Territory (approximately 1900 mm per year). Surely these climate differences affect the two Carettochelys populations (Guinea vs. NT). Even though no morphological variation has been described, the climate differences mentioned above are interconnected with the distinctions in mating and nesting seasons, the size, number and incubation period of eggs as well as the size and weight of new born hatchlings. In order to view these data, please visit the breeding section.